It’s April, meaning my daughter just turned 11, and it’s Cesarean Awareness Month! As a childbirth educator and doula, my Facebook feed has been exploding with all the current improvements to cesarean births. Like my colleagues, I applaud these changes as they not only humanize the surgical birth, but also make the birth healthier for both the infant and mother, and more fulfilling for the mother. But unlike many of my colleagues, I find that these measures fall short of what should really be done to improve cesareans in America. There’s also news of care providers now allowing skin-to-skin contact between mother and infant directly after the birth. This is a great step in humanizing the experience, improving birth satisfaction for the mother, and eliminating unnecessary separation of mother and child. The benefits of skin-to-skin have been well documented for quite some time, (2) and honestly, it’s ridiculous that it has taken this long to include mother-child interaction in 1/3 of American births. I think that women requiring cesareans absolutely should have access to all the improvements listed above, as well as any other reasonable request they may have. (ie: her choice of music playing, her husband/doula/photographer present) But these new measures are far from being routine, and parents shouldn’t assume they will be offered all or any of them. As a country we need to get behind these improvements and encourage them to become routine practice. But there’s also a lot more we need to do. Why aren’t these improvements enough? The measures mentioned above are good ideas to improve certain aspects of the cesarean. 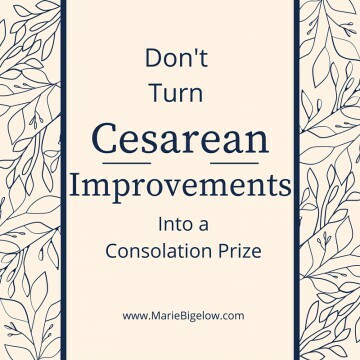 But to the overwhelming majority of American women who receive cesareans, these improvements are a consolation prize. Why? Because over half of these women did not medically require a cesarean. The big issue here isn’t only “how can we make a cesarean a better and safer experience?” We also need to address the fact that our cesarean rate is triple what it should be, that many doctors feel more comfortable performing a cesarean than they do supporting a difficult vaginal birth, and there are financial incentives that feed into our high cesarean rates. Our rates are way too high. The number one reform needed to the cesarean is a lower cesarean rate! The World Health Organization believes that the cesarean rate should be between 5 and 10%, yet America’s rate is a whopping 33%. (4) So no matter how family friendly a cesarean is, the truth of the matter is, 70% of women receiving a cesarean don’t even need one! Cesareans have a large list of potential risks, and improving one aspect of the birth will not remove the side effects of having a cesarean that you didn’t need. Doctors need to feel more comfortable with vaginal births. With a reasonable cesarean rate, women know they are only getting a cesarean if they truly need one. In order to lower our rates, American obstetricians need to get more comfortable outside of the operating room. New doctors to the field report feeling less confident in delivering a baby with forceps or a vacuum as opposed to doing a cesarean. (5) If doctors feel the most competent outside of vaginal birth, then vaginal birth has a very small chance of survival. The American Congress of Obstetrics and Gynecology states that labor dystocia (long labor) is not an evidence based reason for needing a cesarean, and that most women will be able to deliver vaginally when given more time to do so. And since most women desire a vaginal birth, their care providers should be patiently encouraging them, not offering a quick fix with the potential of long-term side effects. For many women, cesareans are scary and their recovery can be long and burdensome. It’s time for the medical world to make some accommodations that improve the experience for women. All women who truly need a cesarean should be treated with respect and given as many family friendly options as possible. We need to improve the cesarean without normalizing it, or using improvements as justification for the continued over-use of them. World Health Organization, The Global Numbers and Costs of Additionally Needed and Unnecessary Cesarean Sections Performed Per Year: Overuse as a Barrier to Universal Coverage, World Health Report (2010) Background Paper, No 30. ACOG, Safe Prevention of the Primary Cesarean Delivery, Obstetric Care Consensus, March 2014. Carol Sakala and Maureen P. Corry, Evidence-Based Maternity Care: What It Is and What It Can Achieve (Milbank Memorial Fund, 2008), 44–46. ← Is Postpartum Your Sabbath or Your Monday?